grand stream dreams: Where is Brave Shakespeare? It was too much to watch last night! The dreaded Lazuli gang of meerkats found the Whiskers' burrow. Shakespeare was driven deep underground to protect his young charges alone by himself. The Lazuli's leader Big Cy led the final attack against the youngsters. When the dust cleared and the returning Whiskers drove the Lazuli away the tiny kids emerged, looking no worse for wear. But heroic Shakespeare? He was nowhere to be found! I was hollering and screaming! How could they end it this way?!!!! Where is brave Shakespeare? Did he survive the battle? Is he OK? 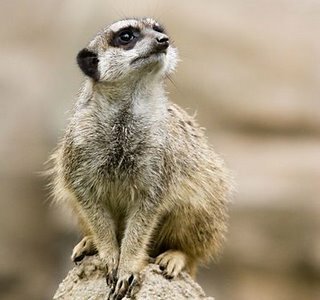 So ends the first-season of Animal Planet's Meerkat Manor.